"Mays Pond" redirects here. For the lake in New York, see Mays Pond (New York). Bothell (/ˈbɒθəl/) is a city located in King and Snohomish Counties in the State of Washington. It is part of the Seattle metropolitan area. Based on per capita income, Bothell ranks 78th of 614 areas in the state of Washington to be ranked. Location of Bothell within King County. Historical plaque at Bothell Pioneer Cemetery. The cemetery founded in 1889, is listed on the National Register of Historic Places. Prior to European settlement, the Sammamish River Valley from Lake Washington to Issaquah Creek south and upstream of Lake Sammamish was inhabited by a population of as many as 200 Native Americans known as the Sammamish. The Sammamish were relocated after the Puget Sound War in 1856 to reservations and non-reservation lands. In 1870, Columbus S. Greenleaf and George R. Wilson filed land claims in the area formerly inhabited by the Sammamish near present-day Bothell, and built homes. Eight families followed over the next six years. In 1876, Canadian George Brackett bought land and began commercial logging out of a camp located on the north bank of the Sammamish River in what is now the heart of downtown Bothell. A store, school, and sawmill followed over the next several years. In 1885, Brackett sold 80 acres (32 ha) to David Bothell, a settler from Pennsylvania. The town's first postmaster, who bought his property from Bothell, named the town in his honor in 1888. Later that same year, a local railroad was built through the town to transport coal from Issaquah. Bothell was officially incorporated on April 14, 1909. Bothell continued to grow as logging expanded and boat traffic brought increasing amounts of goods and passengers up and down the river. As more people moved into the area, the Army Corps of Engineers decided to dredge and straighten the river in the years shortly after Bothell's incorporation. Most boat traffic came to an abrupt end only a few years later when Lake Washington was lowered in 1917. Water transport also shifted to trucks after a brick road was built from Seattle. The logging economy declined quickly around the same time, and the local economy shifted to farming. After World War II, better highways and a post-war boom brought suburban development to Bothell. These new neighborhoods and a series of annexations dramatically expanded Bothell's population from about 1000 in 1950 to over 30,000 as of 2006. Bothell was mostly a bedroom community for people working in Seattle until the 1990s when business development brought new jobs to create a regional employment center with about 20,000 jobs, many in high technology sectors such as biotechnology and software development. In 1990, a campus of the University of Washington opened in Bothell. In 2010, the city of Bothell began a $150 million program to redevelop downtown, including the demolition of 15 buildings, moving State Route 522, expanding the Bothell–Everett Highway, expanding a city park, and expanding the city hall. A major fire in downtown broke out at the Mercantile Building on July 22, 2016, and damaged and closed more than 20 businesses. The fire dealt a blow to the redevelopment program and required state aid for rebuilding. Bothell is located at 47°46′18″N 122°12′16″W﻿ / ﻿47.771670°N 122.204421°W﻿ / 47.771670; -122.204421 (47.771670, -122.204421). The largest river is the Sammamish, which connects Lake Sammamish to Lake Washington. According to the City of Bothell, the city has a total area of 13.7 square miles (35.48 km2), all of it land. Bothell is a geographical oddity in that it straddles two counties (King County and Snohomish County). Because most streets in Bothell are numbered and not named, streets that cross the county line often change numbers. For example, 104th Avenue NE in King County becomes 23rd Avenue SE when it crosses into Snohomish County. Canyon Creek is the residential area east of Canyon Park and south of Maltby Road, with two elementary schools Canyon Creek Elementary, and Skyview Junior High School. The schools are part of the Northshore School District. Canyon Park is a commercial and business district at the junction of Bothell-Everett Highway and Interstate 405, with several restaurants, shops, and grocery stores, along with several major employers. Downtown Bothell, north of Bothell Way on the north side of the Sammamish River, was an area originally settled by pioneers. It contains a business district along Main Street, and several blocks of residences at the foot of Beckstrom Hill. It also contains city hall and the police station, the Bothell Library, and Pop Keeney Stadium. Fitzgerald is a southern extension of Canyon Park containing Canyon Park Junior High. The Highlands is a neighborhood right next to Canyon Park Junior High. Lake Pleasant/Country Village is the area bordering the wooded and winding portion of Bothell-Everett Highway between downtown and Canyon Park. Lake Pleasant hosts an RV park, and Country Village is an outdoor shopping center. Maywood/Beckstrom Hill is a residential neighborhood on the hill north of downtown, and is the location of Maywood Hills Elementary School, Heritage Christian Academy and St. Brendan's Parish School. North Creek, named for Bothell's second-largest waterway, is a business and light industrial district and community with several large big box retail stores, and the production facility for the Seattle Times. The North Creek Forest is recently established protected area in this neighborhood. The residential part of North Creek extends to the beginning of the Everett School District and includes Fernwood Elementary and North Creek High School. Much of it is outside of Bothell city limits. Norway Hill is a residential neighborhood overlooking downtown from the south. Since 2014 all of Norway hill is within the Bothell city limits. Pioneer Hills is a residential community on the hills east of North Creek that borders Woodinville, and contains Woodin Elementary School. Queensgate is a residential neighborhood along Brickyard Road, south of the Sammamish River and adjacent to nearby Woodinville. Mays Pond is a residential neighborhood just north of the Bothell's city limits containing Woodside and Cedar Wood Elementary Schools. Queensborough/Brentwood is a residential neighborhood west and north of Canyon Park, containing Frank Love Elementary School and Wallace Swamp Creek Park. Riverfront, south of Bothell Way and mostly along the south side of the river near Riverside Drive, contains Sammamish River Park, Blyth Park, several residences, and the Northshore Senior Center. Waynita is a residential neighborhood along Waynita Way between Wayne Curve and nearby Juanita. Wayne Golf Course is in Waynita. Westhill is a mid-20th century residential expansion on the hill to the west of downtown, and includes Bothell High School and Westhill Elementary School. Shelton View is a residential neighborhood north of Westhill in Snohomish County containing Shelton View Elementary. Thrasher's Corner is a retail district mostly outside the city limits of Bothell, that along with the residential Red Hawk neighborhood to the east is part of the city's official planning area. Prior to 1993, the nearby city of Woodinville was unincorporated, and some of its neighborhoods were considered part of Bothell and were being considered for annexation. The people of Woodinville voted in 1992 to incorporate, and incorporation was official early the next year. Bothell has a temperate oceanic climate, with cool summers and cool (but not cold) winters. Winter sees much more rainfall than summer and winters in Bothell (much like the rest of the PNW) are very cloudy and overcast. Summers are drier and cool to warm. Bothell is home to Cascadia College and the University of Washington, Bothell. The two institutions share the same campus, which opened in the year 2000. In 2014 the University of Washington Bothell was ranked #37 in the nation among all colleges and universities by Money Magazine and was ranked 6th in the Nation by Washington Monthly in their "Best Bang for the Buck" rankings of colleges and universities. After becoming accredited in 2006 Cascadia College was named the second best community college in the nation, behind Atlanta Technical College. Schools for Bothell students in grades kindergarten through 12th grade are part of the Northshore School District while private schools include Heritage Christian Academy serving kindergarten through 9th grades. Schools in Northshore School district include Fernwood Elementary, Crystal Springs Elementary, Canyon Creek Elementary, Shelton View Elementary, Westhill Elementary, Lockwood Elementary, Frank Love Elementary, Maywood Hills Elementary, Woodmoor Elementary, Woodin Elementary, Northshore Junior High School, Canyon Park Junior High School, Skyview Junior High School, Bothell High School, Inglemoor High School, and Secondary Academy for Success. North Creek High School opened in the North Creek area of the city in 2017. Bothell has a Council-manager government governed by a City Council consisting of seven Council Members, each of whom is elected to a four-year term. Council elections are held every two years, with either three or four positions standing, depending upon year. All positions are nonpartisan and at-large, elected by the entire city voting population. The Council passes ordinances and resolutions, approves the budget, sets policies and adjudicates issues, and elects from its own membership a Mayor and Deputy Mayor for two-year terms. Day-to-day affairs in the city are administered by a City Manager appointed by the council. 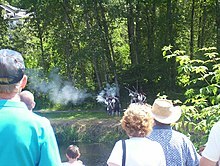 The City of Bothell Freedom Festival, a two-day festival celebrating American Independence, including an annual Fourth of July parade and a reenactment of the Battle of Concord on the Bothell Landing Bridge. The Music in the Park concert series, every Friday in July and August at Bothell Landing Amphitheater. La Fiesta Viva!, a celebration of Latino cultural heritage, at Country Village. Harvest Festival and Pumpkin Carving, at Country Village. Tree Lighting and Santa Arrival, at Bothell Landing. The Bothell Farmer's Market at Country Village. The Cup of Kindness day, held on May 10, was cited by Reader's Digest in its awarding of "Nicest Places in America" honors to Bothell and nine other cities in 2018. Bothell's Pop Keeney Stadium hosts games for several local high schools, including Inglemoor, Woodinville, and Bothell High Schools, even though the stadium was originally Bothell High School's and serves as its most important tenant. Football games at Pop Keeney have become major cultural and, to an extent, spiritual, gatherings for the community. In November 2006, Bothell High School's football team tied the national record for most overtime periods (9) in a quarter-final game against Pasco, which they won 43-40. The previous record was set in Michigan in 1977, between Southeastern (Detroit) and Northeastern, with Southeastern winning, 42-36. The team also had its first appearance in the state finals later that same season, which resulted in defeat to Oak Harbor High School. The Bothell hockey club won the Washington High School Hockey League D2 State Championship in 2006 and 2007. In 2007 the Bothell High School baseball team made it to state playing at Safeco Field. They recorded a 4th-place finish. In 2009 the Bothell Alumni club raised money to get a state of the art scoreboard for Pop Keeney Stadium. In 2009 it was installed, only the 2nd in the state of Washington of its type. Bothell High School's football team has made it to the 4A State Championship at the Tacoma Dome three times, winning it all in 2014. In August 2009, the Ruiz-Costie/Northshore Pool was mothballed following a failure of the facility's boiler. It reopened under a new name as part of the McMenamins Anderson School complex in 2016. In February 2006, Bothell High School's gymnastics team won the 4A State Championships, topping off an undefeated season. In May 2011, Bothell High School's Varsity baseball team won the 4A State Championships. In the 2014-2015 school year, Bothell High School's varsity football team won State Championships. In December 1962, LIFE Magazine recognized Bothell's 112-foot (34 m) Christmas tree as the largest living Christmas tree in the world. However, in the late 1970s, disease attacked the tree, and the top had to be removed. In 2007, about 5,000 to 7,000 people gathered for a parade and outdoor concert at the Veterans Memorial Amphitheater at Bothell Landing in honor of local American Idol contestant Blake Lewis. As of the census of 2010, there were 33,505 people, 13,497 households, and 8,779 families residing in the city. The population density was 2,764.4 inhabitants per square mile (1,067.3/km2). There were 14,255 housing units at an average density of 1,176.2 per square mile (454.1/km2). The racial makeup of the city was 79.7% White, 1.6% African American, 0.6% Native American, 10.2% Asian, 0.2% Pacific Islander, 3.4% from other races, and 4.5% from two or more races. Hispanic or Latino of any race were 8.7% of the population. There were 13,497 households of which 32.0% had children under the age of 18 living with them, 51.9% were married couples living together, 9.1% had a female householder with no husband present, 4.1% had a male householder with no wife present, and 35.0% were non-families. 27.2% of all households were made up of individuals and 8.9% had someone living alone who was 65 years of age or older. The average household size was 2.46 and the average family size was 3.00. The median age in the city was 38.3 years. 22.4% of residents were under the age of 18; 8.1% were between the ages of 18 and 24; 29.3% were from 25 to 44; 28.1% were from 45 to 64; and 12.1% were 65 years of age or older. The gender makeup of the city was 48.8% male and 51.2% female. As of the census of 2000, there were 30,150 people, 11,923 households, and 7,928 families residing in the city. The population density was 2,501.5 people per square mile (966.1/km2). There were 12,303 housing units at an average density of 1,020.8 per square mile (394.2/km2). As of the 2000 census, there are 11,923 households, out of which 33.9% have children under the age of 18 living with them, 53.9% were married couples living together, 8.9% had a female householder with no husband present, and 33.5% were non-families. 25.7% of all households were made up of individuals and 7.1% had someone living alone who was 65 years of age or older. The average household size was 2.51 and the average family size was 3.05. In the city the population was spread out with 25.2% under the age of 18, 8.1% from 18 to 24, 33.2% from 25 to 44, 24.0% from 45 to 64, and 9.5% who were 65 years of age or older. The median age was 36 years. For every 100 females, there were 96.1 males. For every 100 females age 18 and over, there were 93.2 males. The median income for a household in the city was $59,264, and the median income for a family was $68,580. Males had a median income of $48,476 versus $34,385 for females. The per capita income for the city was $26,483. About 3.6% of families and 5.1% of the population were below the poverty line, including 5.0% of those under age 18 and 5.0% of those age 65 or over. In the 2004 U.S. presidential election, Bothell cast 56.29% of its vote for Democrat John Kerry. Bothell was until recently predominantly a bedroom community with most of its residents working outside of the city. Starting in the 1990s, several businesses opened offices in Bothell, creating a regional employment center providing about 20,000 jobs. Many of these businesses are located in the Canyon Park and North Creek business districts. Biotechnology is a key industry, with OncoGenex Pharmaceuticals, Seattle Genetics, CMC Icos, Alder Biopharmaceuticals, MDRNA, Blue Heron Biotechnology, Amgen, Iverson Genetic Diagnostics, and Elitech (formerly Epoch Biosciences and Nanogen) all opening in Bothell. Medical device manufacturers are also located in Bothell, including Philips Medical Systems and Lockheed Martin Aculight. Engineering firms, including electrical engineering, environmental engineering, and civil engineering, are well represented. Examples include SNC-Lavalin, RH2 Engineering, Romac Industries, North Creek Analytical, ECS Engineering, Emulex, and Path Engineers. Bothell also has companies working on new or improved energy technologies, including Neah Power Systems. The US Army has a Reserve facility in the northwest part of the city. The Seattle Times moved its main production facility to the North Creek business district in Bothell in 2001, and national magazine publisher Scotsman guide Media also is headquartered in the city. Defunct retailer Pacific Linen was once based in Bothell until 1996. ^ "City Leadership Team". Bothell WA. Retrieved Feb 23, 2017. ^ "Bothell". Geographic Names Information System. United States Geological Survey. ^ "2010 Census Redistricting Data (Public Law 94-171) Summary File". American FactFinder. United States Census Bureau. Archived from the original on 21 July 2011. Retrieved 17 November 2012. ^ a b c d Wilma, David (2003-06-12). "Bothell -- Thumbnail History". Essay 4190. HistoryLink.org. Retrieved 2008-05-13. ^ Tsong, Nicole (April 6, 2010). "Bothell breaks ground on a grand plan to fix its downtown". The Seattle Times. p. A1. Retrieved September 2, 2016. ^ Coleman, Vernal (July 22, 2016). "Downtown Bothell blaze deals blow to redevelopment efforts". The Seattle Times. Retrieved September 2, 2016. ^ "City of Bothell Annexation 2015". City of Bothell, Washington. Archived from the original on 2015-12-08. Retrieved 2015-11-29. ^ "Climate Summary for Bothell, Washington". Weatherbase. ^ "Bothell, Washington Travel Weather Averages (Weatherbase)". Weatherbase. Retrieved November 23, 2014. ^ Kevin Carey (June 2007). "America's Best Community Colleges". The Washington Monthly. Archived from the original on 2008-02-12. ^ Kevin Carey (June 2007). "Built to Teach". The Washington Monthly. Archived from the original on 2008-01-19. ^ "Community College Rankings". The Washington Monthly. June 2007. Archived from the original on 2008-02-12. ^ Dustin Secrest. "Heritage Christian Academy". ^ "Reader's Digest Reveals the 2018 Top Ten "Nicest Places In America"" (Press release). Reader's Digest. June 20, 2018. Retrieved October 26, 2018. ; "FINALIST: Bothell, WA — 'FOR A DAY OR A LIFETIME' and 'PEOPLE ARE JUST PLAIN NICE'". Reader's Digest. Retrieved October 28, 2018. ^ "Local News | The Birth Of Bothell | Seattle Times Newspaper". community.seattletimes.nwsource.com. Retrieved 2016-01-21. ^ "U.S. Decennial Census". Census.gov. Archived from the original on May 12, 2015. Retrieved June 12, 2014. ^ "Population Estimates". United States Census Bureau. Archived from the original on 2016-10-19. Retrieved June 15, 2016. ^ "Bothell-based OncoGenex says prostate-cancer drug shows promise". Seattle Times. December 4, 2008. ^ "CMC Icos plans $35M expansion of biotech plant in Bothell". Seattle Times. September 29, 2008. ^ "Alder Pharmaceuticals Contact Page". alderbio.com. September 30, 2009. ^ "MDRNA Corporate Facts". mdrna.com. September 30, 2009. ^ a b "Amgen - About Amgen - Locations". amgen.com. Retrieved 20 August 2015. ^ a b c d e "Bothell Landing - Locating a Business in Bothell - Area Employers". Futureofbothell.com. Retrieved 2014-07-12. ^ "Lockheed Martin Completes Acquisition of Aculight Corporation" (PDF). aculight.com. September 2, 2008. Archived from the original (PDF) on March 20, 2009. ^ John Cook. "Google Opens Mysterious Bothell Location". GeekWire. ^ Thermal Exposure. "Contact Neah Power Systems". ^ "US Army Reserve - About - Google". Plus.google.com. Retrieved 2014-07-12. ^ "Pacific Linen moves to cheaper headquarters". Puget Sound Business Journal. Wikimedia Commons has media related to Bothell, Washington.